If your credit is bad and you have been refused regular credit card, then there are ways to establish and rebuild your credit. One of which is to get a secured credit card. Another and probably easier way is to get gas charge card which can be used only at the gas station. That can establish you a positive credit history, probably over a year in most cases. You can easily get approved for this kind of credit card because they have easier underwriting terms. If you use the gas credit card for a year and make sure that you don’t miss a payment and pay your bill in full each month before the due date, then you will have established your credit history. You will then be eligible for the regular credit card. A good thing about gas credit cards is that mostly you can get one with no annual fee. You can apply at most of the gas stations. The credit card is a private-label card. The bad thing about it is that it comes with higher interest rate than the regular credit card – typically closer to 20%, compared with the national average for regular credit cards of about 14%. However, the interest rate does not come into play if you pay the bill in full each month and before the due date. Some cards give you some benefits like the Chevron and Texaco card, offered through GE Capital. For example, they give new cardholders 10 cents a gallon on fuel purchases made in the first 60 days the account is open. Sunoco has a Rewards card issued by Citi Cards. Presently, with this card, consumers earn 5 cents in every gallon of gas they buy. 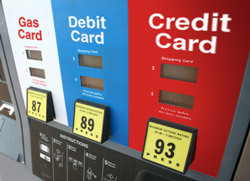 Credit Cards dot Com has a bunch of reward credit cards listed on its page when you use them to get gas at the pump. Bankaholic dot Com also has a list for best gas credit cards for comparison. You can do your own search for best gas credit cards for bad credit. So you definitely have options to establish and rebuild your credit history. It’s just that you have to be careful to not repeat the same mistakes when your credit history went from good to bad to worse.